First, I’d like to start off by mentioning that I recently got a new pair of socks. My aunt sent me a pair of socks in a care package recently. I’m from a county where hunting is a big deal. I, however, do not hunt. 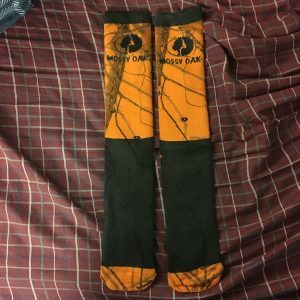 My aunt knows this and therefore, as a joke, sent me orange hunting socks. It’s getting colder and some of our favorite holidays are coming up. There are many, many socks out there that are holiday-themed. I have pairs for Thanksgiving, Hanukkah, Christmas, and New Years Eve. Every major store likes to go all out during the holidays, especially for Christmas. Christmas stuff is everywhere. Target, Walmart, and various department stores will have plenty of holiday theme socks. I have several pairs of holiday socks as I’ve mentioned before. 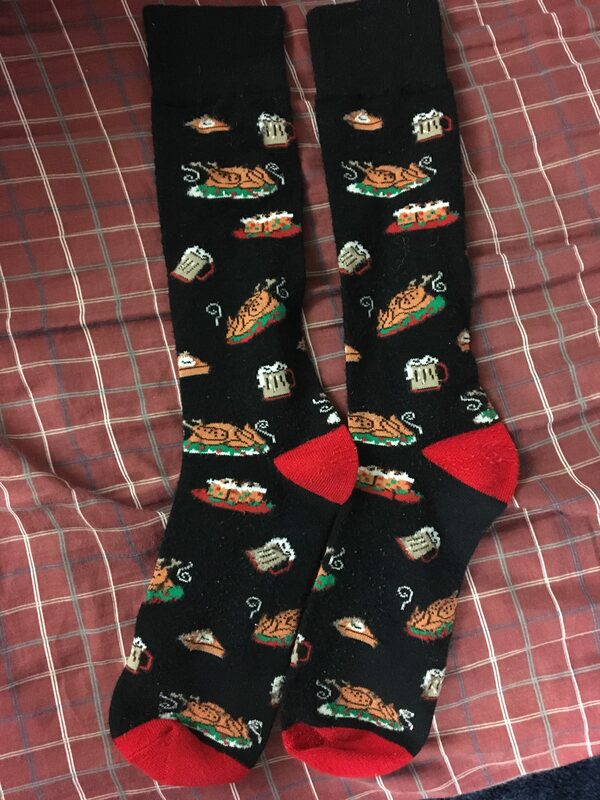 Since Thanksgiving is only a week away I’m getting ready to wear my Thanksgiving socks. I’m pretty excited because (obviously) Thanksgiving is only once a year and isn’t really given a long window of appreciation due to the excitement for Christmas. They’re black socks and they’re kind of long, longer than I usually like my socks. They have some holiday foods such as turkey, pumpkin pie, fruit cake and beer. I believe they were a gift from my mother that she gave to me around the holidays one year but I can’t remember for sure. I’ll probably start wearing my Christmas related holiday socks right after Thanksgiving. I have a few favorites that I’ll be wearing. One of them is very unique and that’s why I like them. I bought them last year while at Target. 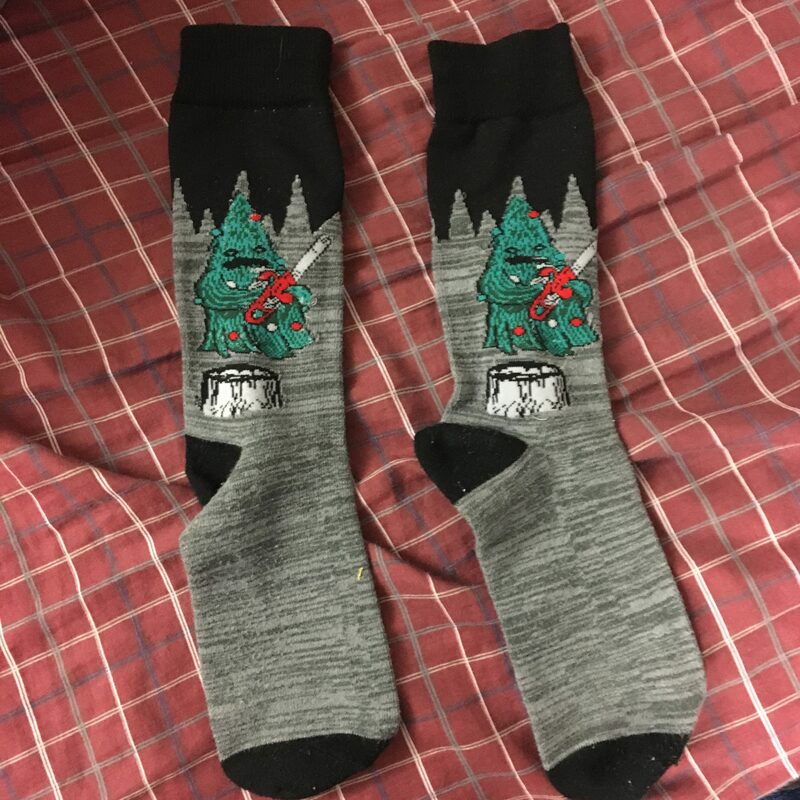 The socks are of a Christmas tree, in a field of Christmas trees, murdering the other with a chainsaw in hand (branch). Yes, the tree is using a chainsaw to cut the others down (don’t worry it’s not graphic). I like these socks because they’re very unique and rather bizarre. It’s kind of weird to explain when people ask about them. The last thing I’d like to touch on is the cold. It’s been pretty rough walking around campus lately with the recent drops in temperature. For many of us, especially those who don’t have boots, our feet are freezing. This can be difficult to deal with. Sure you could put toe warmers in your shoes. But who wants to go through tons of toe warmers? Some of you probably already know this but it is highly recommended to wear wool socks rather than cotton socks when it is cold. Don’t double up your socks. Don’t wear fuzzy socks. Buy somewhat thick, wool socks and you should be good to go. Cotton socks absorb sweat quickly making them feel more wet or moist. This is more problematic in colder temperatures. Wool socks draw sweat away from your feet and dry quickly. This is especially helpful in the winter when you’re walking through the snow and your feet get wet. Wool socks are incredibly helpful during the winter months so if you don’t have any. stock up now. For any of you that have read my previous blog posts, you’ll know that I’m an avid collector of socks. I have many different pairs from many different brands. Some socks are more interesting than others such as the Stance socks with the NBA players or my Superman socks with capes on them. Some socks were more expensive, costing around $16, while others were found for as low as $1. I’ve bought many pairs from many different stores and I’ve also gotten many pairs as gifts. I’ve collected probably at least 60 pairs…but which ones are my favorites? Well it’s not like I’ve ranked them really since I like all the pairs that I have. Also, just because a pair is one of my favorites that doesn’t necessarily mean they’re the most interesting. For now I’d like to talk about just a few of my favorite pairs of socks. 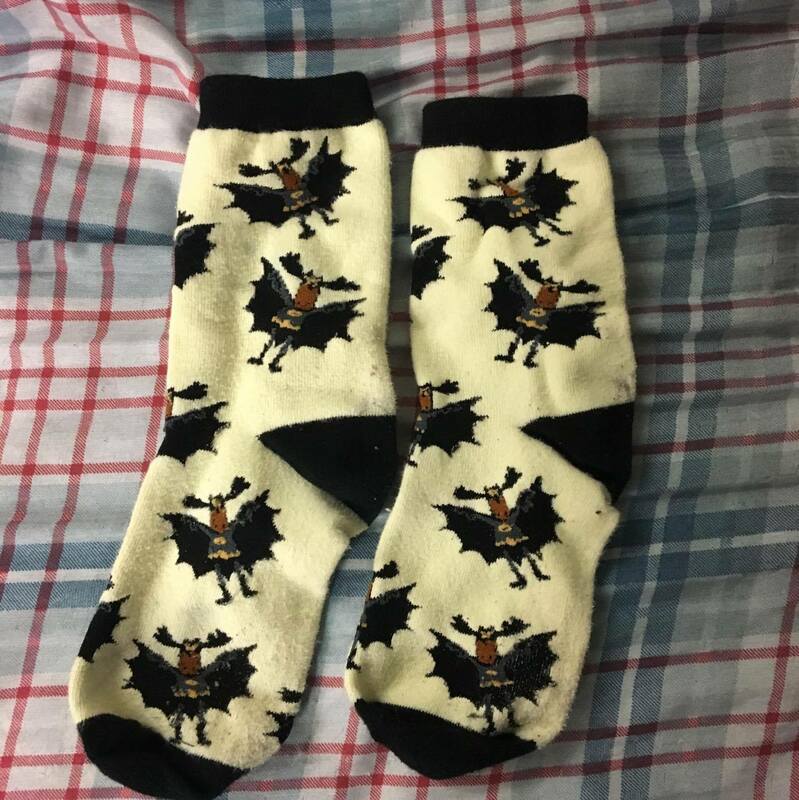 These are my “Batmoose” socks. I bought them during a trip to Quebec. I can’t remember exactly how much they’d cost considering I purchased them with Canadian money but I believe they were around $8-$10. These are one of my favorites because for one they were bought in a foreign country which I think makes them a little more interesting. Also they’re very unique. 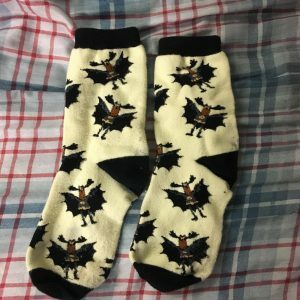 I mean how many times will you ever see Batmoose socks again? Most likely never. Also I think it’s funny to explain the socks to people who ask what they are. These are another one of my favorites pairs. A huge reason these are one of my favorites is because they were the first pair of socks that my girlfriend had bought for me. That makes them really special to me and they always make me think of her. She bought them for me when she went to Disney once. Also they’re just really neat. I’ve gotten compliments on them before. 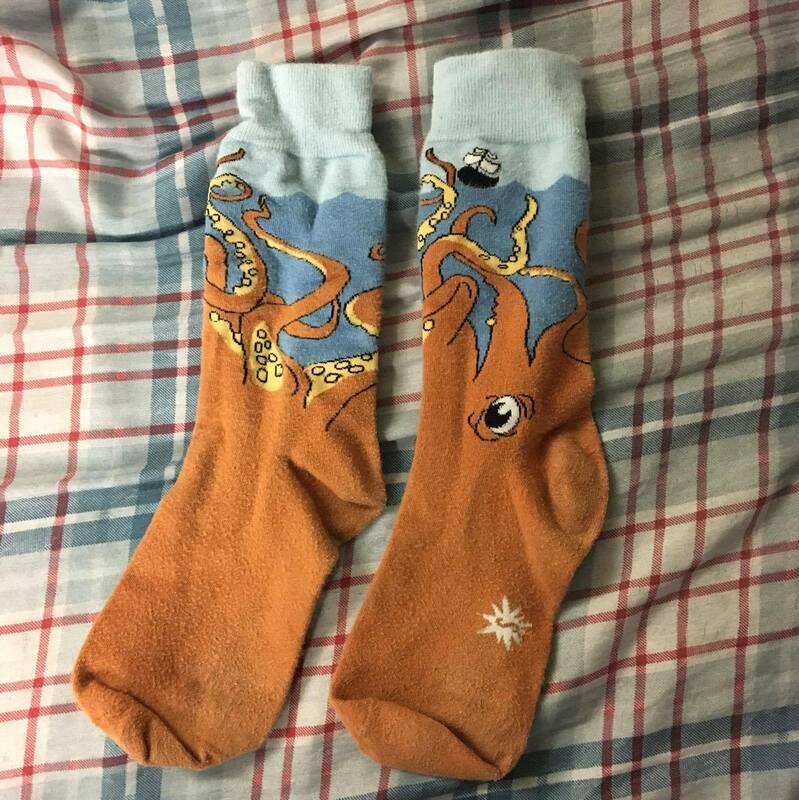 The top of the socks where the tentacles are is very detailed and I like that. These socks are a newer pair of mine but I really like them. I bought them on my Senior class trip to Baltimore in a Target. I was drawn to them instantly. They’re very detailed and I like that. I also really like the two shades of blue. 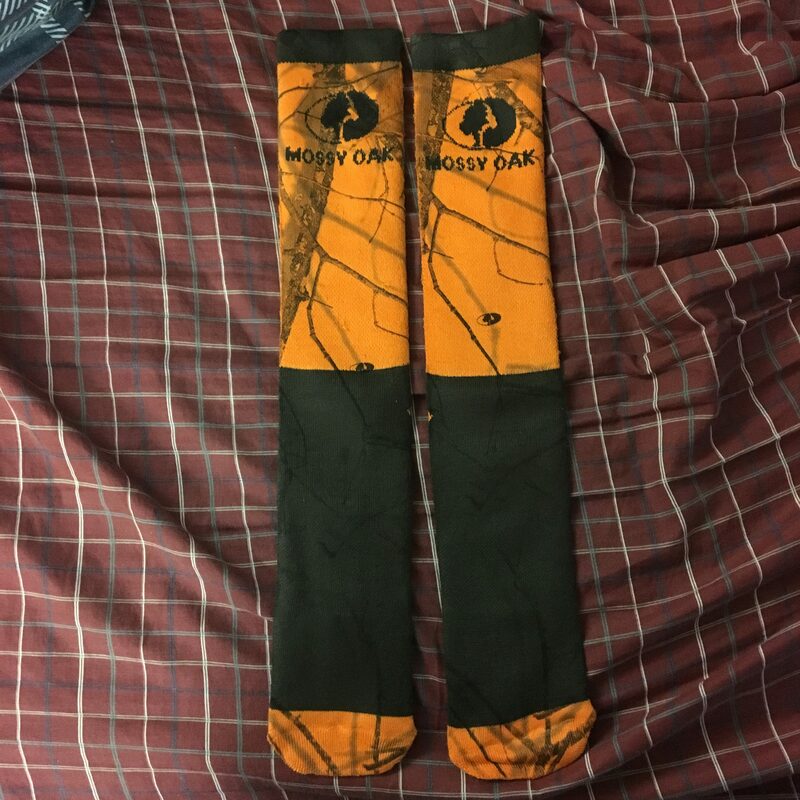 They kind of make the socks stand out. I also really like the old outfit that the golfer is wearing. I’d really love to have this image made in the form of a painting or something. I’ve had these socks for a little bit now. I actually can’t remember for sure where I go them. 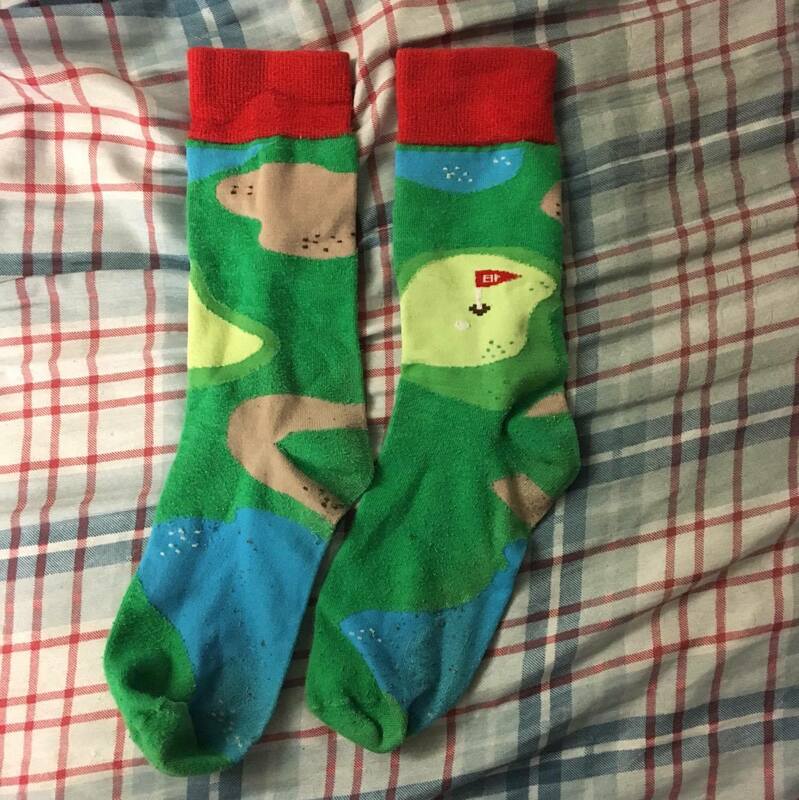 The socks have a golf course on them. I wanted to clarify that because a lot of people ask me what’s on them. I’m not quite sure why I like these socks so much but I wear them often. The design is very cartoonish and kind of like that. 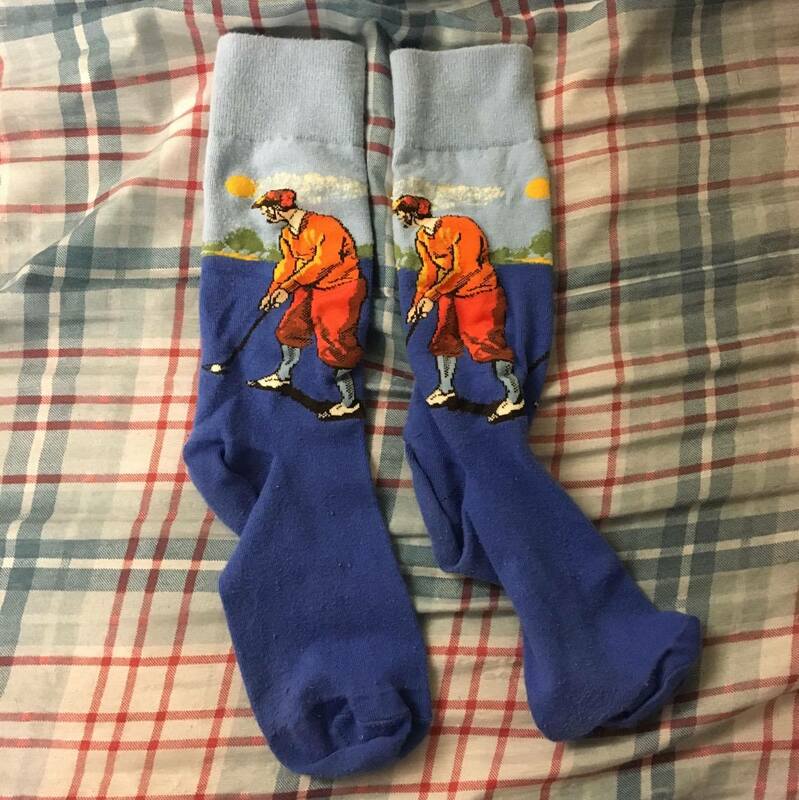 I also find golf to be a very relaxing thing which might be why I like these socks so much. Those are just a few of my favorites. I can’t talk about all of them since I really like all of the socks. Hopefully you can expand your sock collection and have some favorites as well. Author rpl5209Posted on October 8, 2017 1 Comment on Where can you get the best socks? There are many ways you can express yourself with your sock collection. You can really say a lot about your personality and your interest through your socks. With so many different brands and with crazy socks becoming a more popular trend it’s becoming easier to show your personality and add a little flair to your outfit. One of the biggest and easiest things to express is a love of sports. I love basketball and you can definitely see that through the socks that I wear. 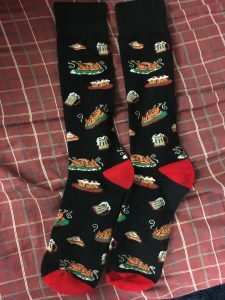 One of my first “funky” pairs of socks were black and red socks with the logo of my favorite basketball team, the Miami Heat, on them. Since then I’ve collected many more sports related pairs. A large portion of those sports related socks display clear photos of famous NBA Players. I have socks with players such as Alonzo Mourning, Shaquille O’Neal, Wilt Chamberlain, Bill Walton, Julius Erving, Allen Iverson, Klay Thompson and Steph Curry (one pair together), Patrick Ewing, and Shaquille O’Neal & Penny Hardaway (one pair together). These aren’t even necessarily my favorite players. I like them at least somewhat (otherwise I wouldn’t have bought them), but they are mostly a cool way to express my love of basketball. I try to get a new pair like these anytime I can find them. I absolutely love these kind of socks with pictures of the players because they’re so unique. I get comments on them all the time. These kind of socks are from my favorite sock brand, Stance. Stance has awesome collections for NFL, NBA, MLB fans and for other sports as well. They’re a really great brand and there’s a lot I could say about them but that’s for another time. 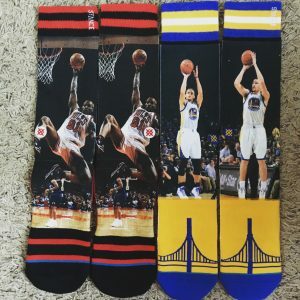 If you’re a big sports fan and looking to up your sock game I would definitely recommend checking them out. There are also many sports stores that carry Stance, as they are becoming more popular, so keep your eyes open for them. There are plenty of simpler sporty socks as well. There are plenty of places that sell socks with simply a team’s logo on them. 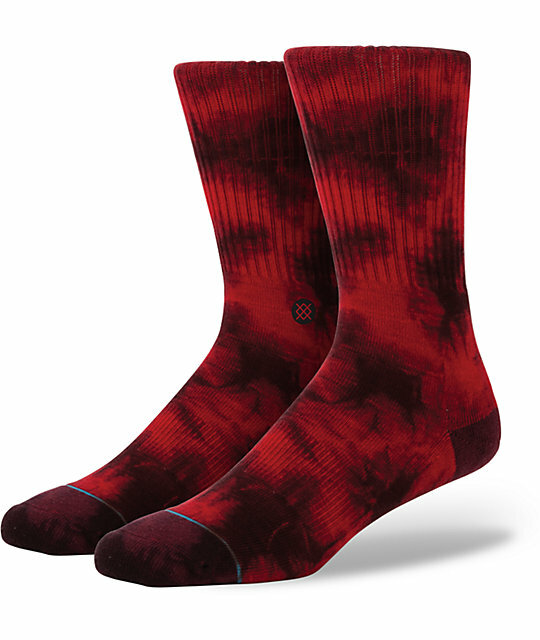 Nice, simple designs are often just enough to express yourself through socks. If you want to go even simpler you can always just wear the colors of your favorite team. Sometimes it’s hard to find socks that are really specific to your interest, but every team has a set of colors and you can always find socks for them. I’ve done it before even when my collection was very small. It’s very easy to find red and black socks. I would put one color sock on one foot and the other color sock on the other foot. You don’t have to show love for a specific team either. I also have other pairs of socks that are simply cartoon basketballs or billiard balls for example. These were only $4 at Boscov’s. It is always good to check the clearance section of any clothing store. You can easily find inexpensive, sports related socks there. Remember, the trick to finding cool socks is to always keep your eyes open. You’ll find cool socks to express your interest of sports or any interest, more often than you might think. Well, I suppose I should start with some background info on why I came to have so many funky socks. First of all my high school had a dress code that was a little strict. You had to wear solid color polos or buttondowns and khakis or dress pants. It could be very boring at times. However there was one thing in the dress code that was permitted, socks could be any color, pattern or design. This was my one chance to really express myself and be creative with how I dressed. My first pair of crazy socks (pictured below) were given to me by my father during my freshman year of high school. I don’t believe he knew that I had thought about wearing wild pairs of socks. However he did know that my favorite basketball team was the Miami Heat, whose colors are black and red. The socks are by a company called Stance which by the way makes the most comfortable socks out there. This kicked off my love for socks. Soon I had other socks, mostly given to me by my father, that had the Miami Heat logo on them. I finally had a way to express myself and show my personally through what I wore at school. I finished freshman year with only a few different kinds of socks but that would quickly change. Sophomore year my father once again made a contribution to what would eventually become my enormous sock collection. It was a pair from Stance, picturing the duo of Shaquille O’Neal and Penny Hardaway from the Orlando Magic. I absolutely loved them. First of all it was so cool to me to have a realistic picture on a pair of socks, especially when that picture involved basketball players. Second, Shaq and Penny were wearing the Magic uniforms from the 90s which I absolutely love. I started wearing these socks as often as I could. As soon as they were washed I’d wear them the next day. The thing I maybe loved the most was people noticed. I got comments on them all the time. Whether it was simply “cool socks” or a fellow basketball fan wondering who was on them. The socks were now a conversation starter. Later that year my father gave me two other pairs of Stance socks. One was a black and white picture of Julius “Dr. J” Erving and the other was a picture of Alonzo Mourning. My love of basketball and my new love for socks were now firmly tied together. I started to totally embrace my love for socks. I wore the crazy pairs as often as I could but it still wasn’t enough. I would ask for them as gifts and always keep my eye out every time I went shopping. Word of advice if you want to get crazy socks, keep your eyes open and look. Crazy socks are more a thing now than ever. You can find them in a lot of places. My collection of socks has grown tremendously since then in part because I would always look for them and also with the help of my father, my mother and my girlfriend. The collection will grow and you will all see them especially if you follow me on Instagram @thebreadtruck6.